Diagnosis: Prairie falcons are large, pale brown raptors with black facial streaks under the eyes. The adults have a dark-blue bill, yellow feet, and a white throat. Females tend to be larger in size. This species is sometimes mistaken for a Swainson's hawk. Natural History: Age of sexual maturity in Prairie Falcons is about 2 years. Breeding typically begins in March and egg laying in mid- to late-April. Only one brood per year is raised with clutch sizes ranging from 2-6 eggs. Incubation lasts 29-33 days and hatching takes about 1-2 days. The young fledge at around 36-41 days around the 3rd week of June. 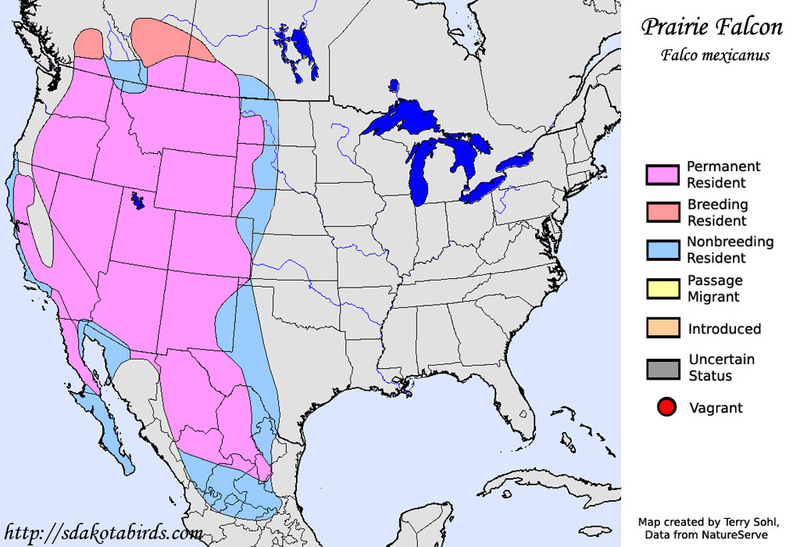 Distribution: Prairie Falcons can be found mainly in western North America. They range anywhere from southern Canada south into central Mexico. This species typically breeds in southern Canada and migrates south to Mexico in the winters. Habitat: During spring and fall migrations, Prairie Falcons typically prefer open grasslands. In the winter, they prefer grasslands and more arid regions such as open deserts. They use the protection of bluffs and cliffs for nesting. Diet: Prairie Falcons eat a wide variety of food types, the most common being ground squirrels. They have also been observed eating small birds, reptiles and insects. Paton, Dale. 2002. Status of the Prairie Falcon (Falco mexicanus) in Alberta. 28 pp. Steenhof, K. 1998. Prairie Falcon (Falco mexicanus). Pp. 1-28 in A. Poole, F. Gill, eds. The Birds of North America, No. 346, Vol. 9, 1 Edition. Philadelphia, PA: The Birds of North America, Inc..
Hubbard, J. P. 1978. Revised check-list of the birds of New Mexico. N. Mexico Ornithol. Soc. Publ. No. 6.